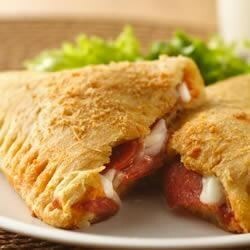 "Make perfect pizza pockets by wrapping pizza sauce, mozzarella, and pepperoni in crescent dough and baking until golden brown." Spread 1 tablespoon pizza sauce on half of each rectangle to within 1 inch of edge. Sprinkle each with 3 tablespoons cheese; top with 6 slices pepperoni. Fold dough diagonally over filling; firmly press edges with fork to seal. Sprinkle each triangle with 1/4 teaspoon grated cheese. With fork, prick top of each to allow steam to escape. You can also stuff them with berries and berry pie filling and glaze with icing, serve them still warm topped with ice cream or whipped cream. i made them exactly as describe and thought the filling was too much - popped out of all 4 of them while cooking - next time i will try making them with the seamless dough instead of crescents. It would be good if it wasn't for the crescent rolls. They are too sweet for the pizza sauce, but it was a neat idea!